Recently, my grandmother passed away. She was 90 and in pain and had lived a full life. So it was a good thing. I flew out to Oregon to attend the funeral. As I was making plans for my trip, my mom said that Bill Lambert had room for me to stay. Bill Lambert is a retired lawyer, who is like the George Bailey for the local Mormon branch in this small Oregon town. My first inclination was to pass on that. That’s very sweet Bill Lambert is opening up his home to strangers for the funeral, but I’ll get my own hotel room. But something inside told me to just go ahead and accept this offering. I don’t sleep well. And going into that trip, I was having a high level of stress and anxiety about my business, cash flow, family, and all those other things people stress and worry about. I was very worried I wouldn’t be able to sleep well. And as my mom drove me up to the Lambert home, I found myself holding a little bit of a spoiled brat attitude and seriously second guessing my decision to accept the Lambert’s kind offer. But from the minute I stepped into that home, I was welcomed with such warmth and love and acceptance by Bill and his dear wife Anita, that those selfish feelings melted away and I opened myself up to receive their service. They set my bed up. Had bath towels and extra blankets placed out. Took me on a tour of the house. Showed me the shower and the bathroom and the kitchen. Opened up every drawer to show me where to get anything I need. They shared stories of my parents and grandparents I hadn’t known. When I mentioned my history of sleep trouble, Anita took it upon her to fix that for me. She gave me her special concoction of “sleeping medicine”, and assured me though it contained a high percentage of alcohol it was Word of Wisdom approved. I don’t know if it was that, or it was an act of God, but I slept well that night …”seemed in Eden’s garden while I dreamed”. In the morning, they fed me. They waited on me. Then when I left, they started giving me things. Anita wanted me to keep that sleeping medicine. Bill gave me a box of extra hashbrowns to reproduce the breakfast at home. I left their home refreshed, rejuvenated, inspired, and spiritually uplifted. The whole experience was like balm of Gilead for my soul. I recently came across this poem from Elizabeth Barrett Browning that has been very significant in my faith journey. This is an allusion to Moses and the burning bush. Moses was looking for him. Seeking him. He turned aside to see. And at that moment, God revealed himself to him. I don’t think of this in a fundamentalistic, literal kind of way. But I do think he is there, and when we seek him, we find him. He’s all around. Earth truly is crammed with heaven. When we seek him, we find him. I saw him on my trip to Oregon. I saw the face of God in Bill and Anita Lambert. I had a moment of inspiration as I left their home. The blackberry bush that crawls along their fence reminded me of this poem. I took a picture of the blackberry bush and then I did some stylization on it in Photoshop to create the image I saw in my head. Kind of cheesy but it’s meaningful to me. Greg Prince explained his view of the restoration with this simple summary. Joseph saw the face of God. And he created a set of symbols that allowed his followers to share in that same experience. For me, it might be as simple as that. 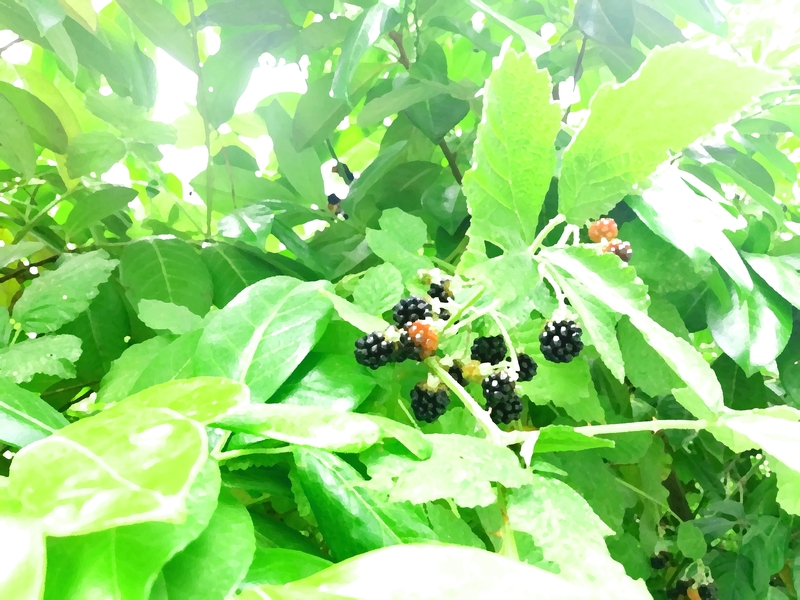 Some look at the blackberry bush and see blackberries. That’s fine. Blackberries are good. No judgement for not seeing anything more than that. But those that are looking. Those with a reverence for God and seeking him in their life. They will see him. And I believe living like that makes life so much sweeter and more abundant.